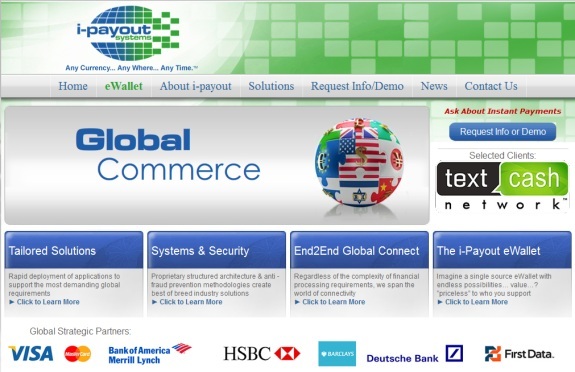 Screen shot: I-Payout website showing logos of "Global Strategic Partners." In April, federal prosecutors described a murky enterprise known as "OneX" as a "fraudulent scheme" and "pyramid" that was recycling money to members in a fashion similar to the AdSurfDaily Ponzi scheme. Now jailed, ASD President Andy Bowdoin was a OneX pitchman, saying he intended to use his "earnings" from the "program" to pay for his criminal defense in the ASD Ponzi case. Like ASD, OneX conducted business with SolidTrustPay, an offshore payment processor linked to one HYIP fraud scheme after another. Mysterious OneX pitchman "J.C." now says the "program" is turning to I-Payout. Back in April, federal prosecutors described the purported OneX “program” as a “fraudulent scheme” and “pyramid” pushed by former AdSurfDaily President Andy Bowdoin, the author of the $110 million ASD Ponzi scheme. Bowdoin, 77, now is jailed in the District of Columbia — in part because of his OneX pitches. He’d initially been free of bond while awaiting his criminal trial in September 2012 on charges of wire fraud, securities fraud and selling unregistered securities in the ASD Ponzi case. Bowdoin was arrested by the U.S. Secret Service in December 2010. The ASD patriarch pleaded guilty in May to wire fraud in the ASD Ponzi case, acknowledging that ASD was a Ponzi scheme and never operated lawfully from its 2006 inception. Bowdoin remained free after his guilty plea. But a federal judge ordered him jailed in June — pending an August 2012 sentencing date — after prosecutors linked Bowdoin both to OneX and a scam known as AdViewGlobal. Bowdoin, according to prosecutors, chose to continue to commit crimes — even after the August 2008 seizure by the U.S. Secret Service of $65.8 million in his 10 personal bank accounts at Bank of America and even after he was arrested on Ponzi charges. In October 2011, Bowdoin told OneX conference-call listeners that they could make $99,000 very quickly and that he intended to use his profits from OneX to pay for his criminal defense in his ASD-related Ponzi scheme trial. College students were excellent prospects for OneX, Bowdoin ventured. Much remains murky about OneX, including the identity of its purported operator and precisely where the company operates from. A male referred to as “J.C.” presides over OneX conference calls, which occasionally continue to be held despite prosecutors’ assertions against the firm in April. “J.C.” has described himself as a “consultant,” even though he apparently is empowered to make financial decisions for the murky enterprise. OneX has announced it no longer is using SolidTustPay, the Canadian payment processor linked to one HYIP fraud scheme after another. But “J.C.” announced during a OneX conference call this week that the “program” was switching to I-Payout, according to a source. “J.C.” made the I-Payout announcement on July 17, the same day the U.S. Senate Permanent Subcommittee on Investigations was grilling HSBC executives, including one who announced his resignation in front of the panel. Part of the presentation by “J.C.” in the conference call included the presentation of a screen shot that showed I-Payout’s name in the back offices of OneX members who’d been wondering if and when the company would find a substitute for SolidTrustPay, according to a source. It is unclear if OneX has an actual account at I-Payout. What is clear is that it is encouraging members to register for I-Payout accounts, only three months after prosecutors described OneX as a scam that was recycling money to members in ASD-like fashion. Bloomberg/Businessweek is reporting this morning that HSBC and Deutsche Bank employees are under investigation for alleged manipulation of the LIBOR interest rate in a growing scandal that also involves Barclays and other major financial institutions. At times one wonders whether the “authorities” are, in fact, serious about money laundering. Outside of the political posturing and media bites the words “terrorism” and “money laundering” provide, that is. and at least tell them they’re under scrutiny. One HSBC executive, Paul Thurston, who was head of retail banking and wealth management, said the bank had taken wrongdoing seriously, and had taken action on many occasions, including dismissing staff. I really hope that HSBC has taken this seriously. If the are continuing an association with an obvious ponzi payment processor, then they need much, much better procedures in place. I had some dealings with HSBC years ago, back when they were Household Finance. They were crooked then, they are still crooked now. No great surprise there. LOL, I have a credit card with them. I use it every other month or so for a under a dollar purchase and pay it off immediately. That keeps them sending a statement every month and paying bookkeepers and auditors…! laidback: LOL, I have a credit card with them. I use it every other month or so for a under a dollar purchase and pay it off immediately. That keeps them sending a statement every month and paying bookkeepers and auditors…! At least you’re keeping someone employed and not stealing their wages. We’ll call your plan laidbackX. It seems that i-Payout is now functional on OneX, after a very long wait. I wonder how many people OneX lost because of all the delays and silly excuses. I wonder how long they will last before someone steals a large amount of money?? Well, when Dirson E. Jimenez Santana writes a blog post explaining why he’s pulling out of a program it’s pretty safe to say that the fork stuck in it is too large to hide from the marks.